Turn pizza night at home into a special date night dinner. 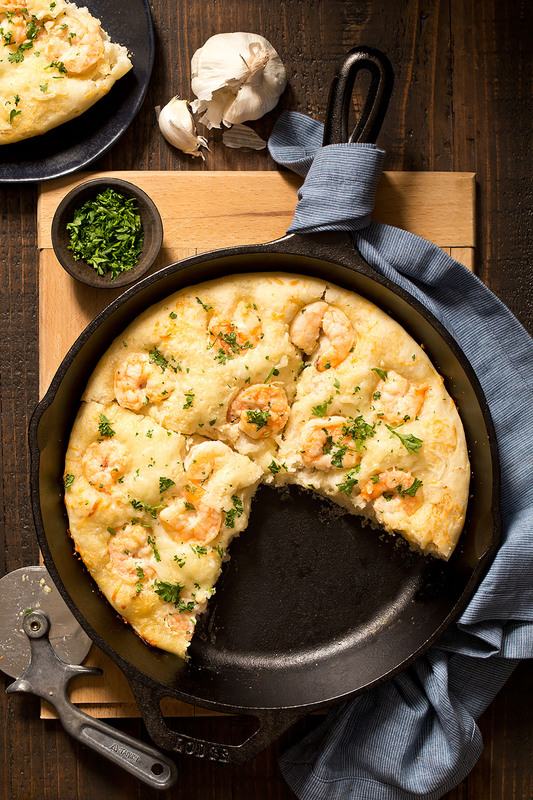 Shrimp Scampi Skillet Pizza For Two with a white wine garlic butter sauce and homemade pizza dough is ideal for Valentine’s Day, anniversaries, birthdays, and days off together. In a large mixing bowl, mix together the warm water, oil, and yeast. Let sit for 5 minutes. After 5 minutes, add 1 cup flour, sugar, and salt. With the paddle attachment on a stand mixer or a regular hand mixer, beat until everything is combined (the dough will be wet and loose). Gradually add enough of the remaining 2½ cups flour and beat until the dough is slightly sticky and elastic. If it's still too sticky, add up to an additional ¼ cup flour. If using a stand mixer, switch to a dough hook attachment and knead for 4-6 minutes or until the dough pulls away from the sides of the bowl. If not using a stand mixer, knead the dough on a floured surface for 5-7 minutes. Place the dough in a lightly-oiled bowl and cover with a towel. Let the dough rise in a draft-free warm area until doubled in size, about 60-90 minutes. Place pizza dough in the center of a 10-inch cast iron skillet. Gently stretch the dough until it covers the bottom of the pan. In a large skillet, heat the oil and butter. Once melted and hot, add the garlic and cook 1 minute. Add the wine/broth and cook until reduced by half, about 2-3 minutes. Stir in lemon juice and salt. Generously brush about half of the sauce over the pizza crust. Sprinkle with mozzarella. Add the raw shrimp on top, brushing with remaining sauce. Bake 15-18 minutes or until crust is golden brown and cheese is melted. Garnish with parsley before serving. Recipe created by Chocolate Moosey. This pizza dough recipe makes enough for 2 skillet pizzas. Since making the dough takes time, it's nice to have a spare dough in the freezer to use at a moment's notice. However, if you don't want extra dough, split the dough ingredients in half. Instructions for refrigerating/freezing dough: Spray dough ball with cooking spray or lightly coat with oil. Wrap dough ball in saran wrap (and then in foil if freezing) and place in zipper bag (freezer bag if freezing). Use within 48 hours if refrigerated and within 1 month if frozen. Let dough thaw overnight in refrigerator and then sit on counter at room temperature for 1-2 hours before proceeding with next step.